By Allan Fox: Adrien ‘The Problem’ Broner (33-3-1, 24 KOs) called out former 2 division world champion Timothy ‘Desert Storm’ Bradley (33-2-1, 13 KOs) today to face him at a 144 pound catchweight. Broner must have his reasons for calling out a retired fighter like the 34-year-old Bradley, who hasn’t fought in 2 years since his 12 round unanimous decision defeat in his third fight against Manny Pacquiao in April 2016. Bradley is accustomed to fighting on PPV. He might not like the idea of facing Broner on regular Showtime Boxing. The payday that Bradley would get for fighting Broner would be far lower than the one he got in his lat fight against Pacquiao in 2016. That fight was on PPV. Broner is not a PPV fighter. But it wasn;t long ago that Broner fancied himself as being the guy tjat would replace Floyd Mayweather Jr. as the next PPV star. So what happened? Broner’s losses to Marcos Maidana, Shawn Porter and Mikey Garcia hurt his career. 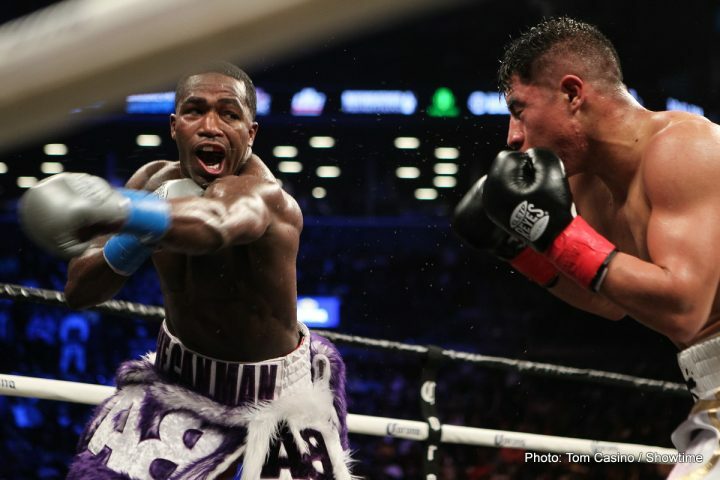 Further, Broner’s poor performances against Adrian Granados and Emmanuel Taylor also hurt his popularity. “Timothy Bradley, bring you [expletive] back and get this whipping…Meet me at 144,” Broner said on his Instagram. Bradley would be viewed as the favorite to beat Broner if that fight were to happen. Broner is slow, hittable and too flat-footed. He would be ideal for Bradley to outbox or even out-slug. Broner might wind up sorry for asking Bradley if he agreed to face him. Broner is at his best when he’s outside of the ring talking trash on social media or speaking at the press conferences. But when he’s fighting, he’s not so great. He really struggles. The fact that Broner couldn’t even beat a fringe welterweight contender like Jessie Vargas was troubling. Broner’s performance against Vargas showed that he doesn’t have a future at 147 as one of the major players. You can say the same thing for Broner at 140. He’s not going to be able to beat the top fighters Regis Prograis, Kiryl Relikh, Sergey Lipinets, Viktor Postol, Josh Taylor and Terry Flanagan. Broner changed out his trainer recently to try and shake things up, but it didn’t help much. He still failed to get the victory in his fight against Vargas. Broner making 144 would be a big accomplishment. He’s been struggling with the weight. He’s technically fighting at 140, but for some reason he keeps competing at welterweight instead. When Broner made 140 for his fight against Mikey Garcia last year in July, he looked weight drained, and he lost the fight. Broner probably can’t make 140 any longer without draining himself in the process. It’s kind of sad though because he’s never going to be a factor at 147, because he lacks the natural size, power and speed to compete with the best in that weight class. Broner wants to be a world champion, but he doesn’t have the talent to make it happen at light welterweight or welterweight. If Broner tries to win a world title at 140, he’s going to run into immediate trouble against the likes of Jose Ramirez, Kiryl Relikh. Bradley seems pretty happy being retired. He’s been working on ESPN broadcasts for Top Rank fights, and he’s been doing an excellent job as a commentator. He’s probably the best thing the ESPN broadcast team has going for it right now. Without Teddy Atlas bringing energy to the commentating, Bradley is the only positive light. There might not be enough money to get Bradley to come out of retirement for a fight against Broner. It’s not as if Broner has been doing well with his career. In his last fight against Jessie Vargas, he fought to a questionable 12 round draw on April 21 at the Barcays Center in Brooklyn, New York. The fans overwhelmingly saw Broner losing that fight. Vargas dominated early and late. Broner wasn’t throwing enough shots, and fighting like he was scared of Vargas. Broner could really use a win right about now, as he’s been struggling as of late. Broner hasn’t won a fight in 15 months since his controversial 10 round split decision victory over Adrian Granados in February 2017. That fight took place in Broner’s hometown of Cincinnati, and he looked like he deserved a loss. If you don’t count that as a legitimate win, you have to go back all the way to April 2016, when Broner last won a clear victory without controversy in stopping fringe contender Ashley Theophane in the 9th round. Bradley’s last five fights, he’s posted a record of 2-2-1. His 12 round draw against Diego Chaves in December 2014 was a fight that should have gone to the Argentinian. Bradley was the A-side in that fight, and he looked bad all the way though. Bradley’s wins in the last part of his career came against Brandon Rios and Jessie Vargas.